Campers will learn about the science of robotics with historical information, discoveries, and advances in robot technology. Newton’s Laws will be emphasized all week and each camper will receive three robot kits to work on. Campers will be able to take home their remote controlled robots at the end of the week! Tons of great building projects with our Robotic Arm and Dodeca 12 in 1 Solar Hydraulic Robot. Campers will also learn to solder when they build the Blinky robot! The OWI, Inc. Robotic Arm Edge is the perfect learning tool for understanding the inner workings of a robot that is identical in nature to the robots being used in industry today. 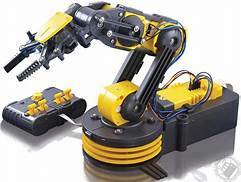 With Robotic Arm Edge, command the gripper to open and close, wrist motion of 120 degrees, an extensive elbow range of 300 degrees, base rotation of 270 degrees, base motion of 180 degrees, vertical reach of 15 inches, horizontal reach of 12.6 inches, and lifting capacity of 100g. WOW!